Failed because he won. OK, failed because maybe I forgot to publish these. Let's see what we got here. Announcer: OH MY Goodness! 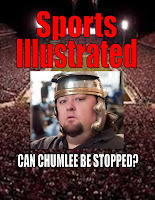 He missed, I caant't believe he missed, Chumlee is no longer perfect! I've done my part. This always works. Fee Phi Pho Fum, Bella and Edward are having a baby, give me a fcking break. It's the law of averages, his picks will normalize to 50%. So going forward he should pick the opposite of what his real belief is. Or, only switch on games he's 50/50 on. Or maybe the luck is really bad, pick only the games you're most sure about. Just think about it next time you pick. Send him to Dr. Morgus! Jinxes are powerless to stop one with such powers. I say congratulations to the Banditos, you've clearly wrapped this season up and the rest of us are playing out the string for 2nd place. I think Chumlee might go 100% the rest of the way. He is just that good. Chumlee, I hope your game picking goes the way of Terrell Owens' career. Booley booley junta jinga cluck cluck. Eesh née née neesh, ash nee neckkk noooooo. Cluck cluck bey kong waaaaa noch. Vlaaaaaaaaaa hya. i have no clue what you're talking about but i have no doubt that it's completely insane and must be stopped. we should get the people out and start a movement. 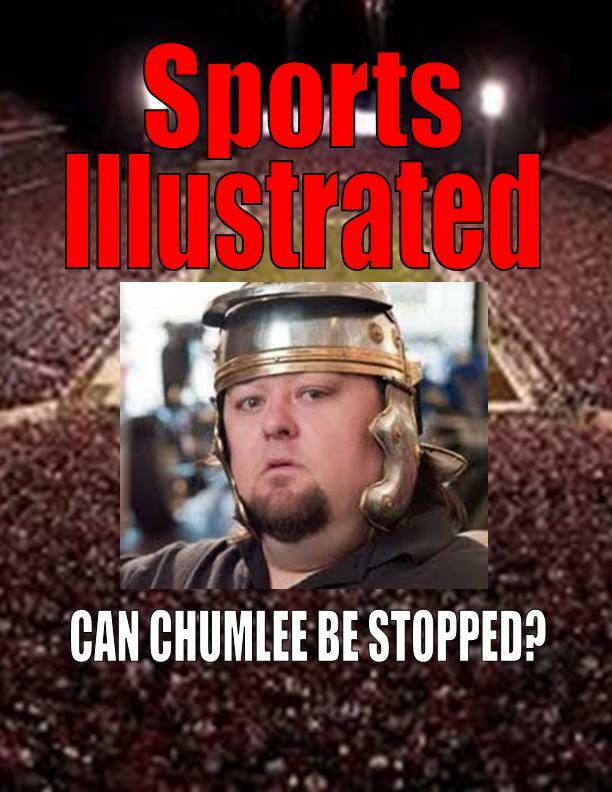 occupy chumlee. we are the 99. fight the power. arrrrrrrrgh. Someone call the Famous Chicken to give him the "Chicken Zap"
This is your National Title YEAR! All you have to do is show up and play. Don't even worry about that Tech game, you are invincible at home. "do you know you have 3 birdies in a row and if you par this last hole you'll shoot a 37 on the back"
Curse of the Sports Illustrated Cover. I will email the photo. I wish I could give you more than 5 points. This is worth 5x that. You know the sad part of this whole thing is that I haven't watched an entire college football game all season and I am doing better in these picks than my other pro pick 'em leagues. Thanks all. I love all your "jinxes"....clearly they didn't work. Now for the real secret....this is like shooting myself in the leg like Plaxico but oh well i like you guys..the real secret of my success is whatifsports.com. it's a free sports simulator that can quite accurately predict the out come of college and pro games while changing all kind of variables from players to even the weather! Check it out and see how it works out for you in the playoffs l. I didn't spend a whole lot of time changing variables and just went with the defaults ....didn't turn out too bad uhh? Can I get a trophy too?